Question.7: How does industrial brownish explain Darwin's theory of Natural Selection? Question.8: What are fossils? Mention any two way in which the study of fossils support biological evolution of an organism. Question.9: Explain Darwinism and criticism. Question.10: Explain in brief regarding origin of source of variation. Question.11: Explain in brief regarding human evolution. Answer 7: In England, it was observed before industrialization that white-winged moth (Biston betularia) were more in number than dark-winged moth. But the situation became reversed after industrialization. It was argued that predator will spot and pick a moth (Biston betularia) against a contrasting background. In pre-industrialization, the tree trunk was covered by white lichens and on white background dark colour moth can be picked up. The situation changed during industrialization, the tree was covered by dar, dust, coal particles and become dark on which white moth can easily be picked up. Thus, it is a case of natural selection which built pressure on population and some members are selected for evolution. Answer 8: The remains or evidences of pre-historic life is called fossil. (i) The study of Archaeopteryx reveals that birds have evolved from reptile, so fossil provide evidence for evolution. (ii) Phylogeny can be reconstructed from the fossils. (iii) The habitat and behaviour of extinct organisms can be inferred from well preserved fossils. 1. Great weakness: He was unable to explain the cause, origin and inheritance of variations. 2. Raw Material for evolution: He regarded all small and continuous variations, which may be acquired by organism during their life time due to environmental effect but somatic ones never play this role. 3. Theory of pangenesis: As it is cleared that Darwin was failed to explain the origin of variations at genetic level as well their transmission to next generation. In 1868, Darwin put forward his own theory of inheritance, the Theory of pangenesis. According to this theory, every organ of the body produce minute hereditary particles, called Pangenesis or Gemmules e.g., live Gemmules from liver, leg Gemmules from leg, and so forth. He thought the Gemmules were carried through the blood form every organ of the body and were collected together into the gametes. 4. Certain useful or harmful variations are brought about by mutation (Sudden changes in genetic material) and Darwin knew about these sudden changes (Mutation) and called these sports, but Darwin either ignored these observations or kept silence. 5. The variations of Darwin originated by natural selection are gradual (not in single step) and certain variations such as electric organ of Torpedoes, light producing organs of luminescent organism (Glow worm) etc., are functional and useful only in their perfected state (in fully developed state not in under developed state) and could not be originate through natural selection while only possible through mutation. 6. There are some examples of overgrowth of useful cousins beyond the limit of usefulness and bring down extinction of some species rather than evolution, and it is said clearly that it is not possible through adaptation and natural selection e.g., Antlers of Iris elk, teeth of Sweedolon. 7. Darwin was also unable to explain how does set of coordinated organ evolved through natural selection. (Gene flow).Sometimes two populations of a species which were separated, come close due to migration. The genes of two populations mix through breeding and the result causes variations in the offspring. The random introduction of alleles into the recipient population and their removal from donor population affects the allelic frequencies of both the populations. Gene flow decreases the genetic differences between populations. According to Hugo De Vries, it is a sudden heritable changes. Single step large mutation (saltation) brings speciation. Crossing over or independent segregation during meiosis followed by random fertilisation are referred to as genetic recombination. This selection operates in stable environment. In this process extreme individuals from the two ends of the phenotypic distribution are eliminated. Stabilizing selection does not promote evolutionary change that leads to speciation, but tends to maintain phenotypic stability within the population over generations. It removes deleterious genotypes from the population. This selection operates in response to gradual changes in environmental conditions. It works by constantly removing individuals from one end of the phenotypic distribution. Therefore, average value of fitness is coherently shifting towards the other end of the phenotypic distribution. This is a rare selection, but very important in bringing about evolutionary change. This process operates in the changing conditions within an environment (heterogeneous environment) which increases the competition in the population. This can split the population into two or more sub populations called Species populations. It is also called as Adaptive radiation. Answer 11: Humans were developed from ape like ancestors. Human beings belong to order Primates, sub order Anthropoidea, super family hominoidea, family Hominidae and sub family Homininae. 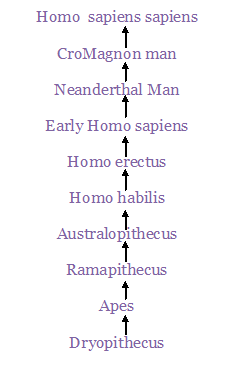 The term "anthropoid apes" is used for common ancestors of humans, apes and monkeys. Humans, apes are their common immediate ancestors. About 15 million years ago, primates called Dryopithecus and Ramapithecus were lived on earth. Dryopithecus was more ape-like. Ramapithecus was more man-like. It is believed that most of the human evolution occurred in Ethiopia, Kenya, Tanzania (East Africa). Fossils of man like bones were discovered in Ethiopia and Tanzania, based on these fossils it is believed that man like primates walked in Eastern Africa about 3-4 million years ago. These were approximately four feet tall and walked up right.